The Latin American world has been known for producing a fair number of extreme metal bands such as Sepultura and Cenotaph, but there exists in these countries a thriving power/traditional metal scene made up of many talented bands carrying on the tradition of "true" metal. 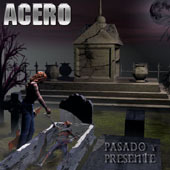 Acero (whose name is Spanish for Steel) is one of these bands, but also has the distinction of being one of the very few metal bands from the small country of Costa Rica. Acero actually has a long history stretching back to 1985 when they formed, becoming the first heavy metal band in their country. Obviously, the local scene at the time was difficult to work in and so after 6 years, numerous line-up changes, and one demo the band split up. Five years later, two of the original members - Jorge Molina and Francisco Pujol - reunited with former member Francisco Alvarado to resurrect Acero. This time around they were able to enter the studio and record their debut full-length, Pasado y Presente. As the title implies ("Past and Present"), this album contains material composed over the bands 17-year history. First off, the entire album is in Spanish - including the liner notes and lyrics. So if you're like me and have difficulty ordering lunch at Taco Bell, don't count on understanding much about the lyrics. But if you're interested in a tight classic metal sound, then by all means read on. The first track on the album, "Pasa La Raya", is a straight-up riff-driven '80s metal trip built on the powerfull voice of Adrian Moya, great solo work by Jorge Molina, and the strong bass presence of Francisco Pujol. Judas Priest is mentioned several times as an influence, so it's not surprising that many similarities can be heard on the first few songs of Pasado y Presente. "El Rey Del Rock n Roll" ("The King of Rock n Roll") was written in memory of Jose Capmany, a musician and friend of the band who passed away in 2001. The sound on this track is more in the vein of Under Lock And Key-era Dokken with a great underlying riff interspersed with a few lightning licks. Although Dio is not listed as an influence, I was immediately struck by the fact that "Dos Lunas Negras" could very well be a slower paced "Holy Diver". The basic riff is quite similar, but the twin-guitar bridges and sprinkling of keyboards work to give the tune its own identity. However, it's at the end of this song that one of Acero's weaknesses is brought to attention. While Adrian Moya certainly has a good voice for this style of metal, he occasionally ventures into Bruce Dickenson-like moments that are really a tad out of his range. Next up is "Pendulo", a guitar-driven instrumental that, while showcasing the talent of Jorge Molina, still manages to display how tight Acero is as a band - not to mention serves as a great bridge between the bands earlier work and their more recent songs. The aptly titled "Reencarnacion" introduces the listener to Acero's latest direction with a great Iron Maiden inspired opening and chugging riffs reminiscent of Saxon. Acero is certainly a talented outfit, delivering tight and true-to-form '80s-style metal with efficiency. It's their adherence to the common elements of the genre without infusing a lot of originality, however, that gives this album an overall middle-of-the-road feel. Pasado y Presente is a great glimpse into the career of these Costa Rican metalheads, though, and shows a promise of good things to come. The CD is available from the band at their website.